Original 1957 Mono EP. Style: Soundtrack, Rock & Roll. Vinyl: EX sticker with the number 6212 on each side, Promo sticker on Side 1. Cover: EX stickers with the number 6212 on the top corners of the front and back, light ring wear on the back. Top seam had a very clean split which we repaired with archival acid free document repair tape. 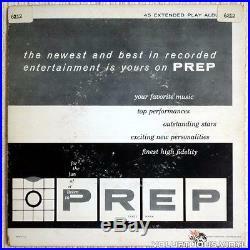 Label: Prep Records M1-1. (info and photos from our website voluptuousvinyl. Com). 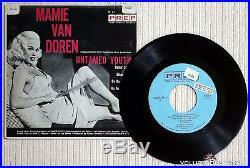 The item “Mamie Van Doren Untamed Youth (1957) Original Pressing 7 Vinyl Record EP” is in sale since Friday, March 31, 2017. This item is in the category “Music\Records”. The seller is “theanswerreturns” and is located in Rancho Cucamonga, California. This item can be shipped to United States.